In the first part of this teaching, an overview of the life of Apostle Paul was presented and some lessons gleaned therefrom. You may wish to click on the title below to read it if you have not as it forms the background to the present topic. This second part examines how God’s grace was demonstrated in various aspects of his life. This being the fifth topic in the Grace Series, there were three topics befire we began to look at the life of Apostle Paul. You may wish to read them also by clicking on the titles hereunder to get the entire package of blessings. Read and be blessed! According to him, God did this to make him an example to others of His infinite mercy and patience (v. 16) and a truly worthy example he turned out to be. So, are you counting yourself too far gone to be saved? Take a look at Paul’s life and make your way to the cross. No one is unworthy of salvation, no one is beyond the reach of God’s grace. 2. Uncanny insight into the mysteries of God’s salvation plan and the age to come and the ability to teach these to others: Paul had an unsual level of revelation of the mystery of God’s salvation plan and taught it extensively throughout his ministry (Ephesians 3:1-11). The mystery was that God had opened the door of salvation to Jews and Gentiles alike that they might be His co-heirs with Christ (Romans 8:17). He even saw revelations of things in heaven which he was forbidden to speak about (2 Corinthians 12:1-7). Apostle Peter acknowledged that Paul had special wisdom from God and taught things which were “hard to understand” in his letters, things which some people were twisting to their own ruin (2 Peter 3:15 &16). Although Paul was learned and could sound obscure to the babe in Christ, with time his teachings become plain to one. He broke down for us the fruit and gifts of the Spirit, spiritual offices, the transition from law to grace, you name it. And it was all by grace. In the passage we saw earlier in Ephesians, chapter 3, he described it all as “the stewardship of God’s grace that was given to me ….” (v. 2). Do you need wisdom? Is there an intricate problem you are facing? Are there hidden things that are necessary for you to know? Make the God of grace, who equipped Paul for his ministry your recourse. Or do you have the knowledge but have no idea what to do with it? The God who helped Paul to interprete the mysteries and revelations he saw for our benefit can be your guide. 3. Unusual exercise of spiritual gifts: Paul operated virtually all the spiritual gifts enumerated in 1 Corinthians 12:8-10. For example, Gpd used him to perform miracles, including raising the dead, like the young man, Eutychus, who fell down from the third story window he was sitting on after falling asleep one night while Paul was giving a long farewell speech (Acts 20:7-12). Paul, among other things, spoke in tongues, prophesied, declared words of wisdom and knowledge, discerned spirits and healed the sick as shown above. One more example will suffice and it relates to discerning of spirits. Thus we see fulfilled in the life of Paul the promise of our Lord Jesus in John 14:12. The same promise is applicable to us today and it is not by academic knowledge, physical strength or anything we can boast about. It is only by grace as we put it to use by taking little and big steps of obedience, especially through sharing the gospel to the unsaved and teaching the saved. 4. Working extremely hard in service to God: Paul was not among the first apostles who walked with Jesus during His earthly ministry, but he outworked the others by grace. He was always on the go and writing when he was stationary. His extensive missionary journeys yielded new churches in different lands and upheld them for some time suvbsequently. His letters were a comfort and guide to the churches. He complemented these efforts with prayers, fasting and working at his craft as a tentmaker to sustain himself and his co-labourers. Although he was entitled to support from the churches, he didn’t insist on it in order not to jeopardise his results and to enable him give the gospel free to all. “… the Lord commanded that those who proclaim the gospel should get their living by the gospel (v. 14). “… Nevertheless, we have not made use of this right, but we endure anything rather than put an obstacle in the way of the gospel of Christ (v. 12). “What then is my reward? That in my preaching I may present the gospel free of charge …” (v. 18). 5. Endurance of much suffering for the gospel: Paul was more or less pushed to recount some of the terrible experiences he had while preaching the gospel in 2 Corinthians, chapter 11. He recalled he had been subjected to “far more imprisonments, with countless beatings, and (was) often near death” – 2 Corinthians 11:23 (word in bracket mine). “Five times I received at the hands of the Jews the forty lashes less one. Three times I was beaten with rods. Once I was stoned. Three times I was shipwrecked; a night and a day I was adrift at sea; on frequent journeys, in danger from rivers, danger from robbers, danger from my own people, danger from Gentiles, danger in the city, danger in the wilderness, danger at sea, danger from false brothers” – 2 Corinthians 11:24-26. To make matters worse, Paul had what is supposed to be a chronic physical ailment. “… to keep me from becoming conceited because of the surpassing greatness of the revelations, a thorn was given me in the flesh, a messenger of Satan to harass me, to keep me from becoming conceited. Three times I pleaded with the Lord about this, that it should leave me. But he said to me, ‘My grace is sufficient for you, for my power is made perfect in weakness.’…” – 2 Corinthians 12:7-9. 6. Willingness to give up everything and die for the gospel: Paul had a good understanding of his calling and was willing to forgo everything for it. He was not even afraid to die for the gospel. He stated this unequivocally on different occasions. “But whatever gain I had, I counted as loss for the sake of Christ. … For his sake I have suffered the loss of all things and count them as rubbish, in order that I may gain Christ … that I may know him and the power of his resurrection, and may share his sufferings, becoming like him in his death” – Philippians 3:7,8 &10. 7. Humility in spite of his many and outstanding accomplishments: The grace of God kept Paul humble when he could have been arrogant and proud. We see this from his writings. “To me, though I am the very least of all the saints, this grace was given, to preach to the Gentiles the unsearchable riches of Christ” – Ephesians 3:8 (boldface for emphasis mine). On the occasions he gave his credentials to prove a point, he emphasised that he shouldn’t be drawing such attention to himself and gave the glory to God as in two verses cited earlier (2 Corinthians 11:23 and 1 Corinthians 15:10). We saw in the first part of our teaching on Paul’s life (The Overview) that he was very zealous religiously to the extent of persecuting the church. Although, he was wrong, Paul was sincere such that once he encountered the truth, he did an about-face and began to propagate it with even greater vigour than he did his old faith. It is a tragedy when someone knows the truth but chooses to cling to error for whatever reason. We also saw that Paul was conscientious in spreading the gospel and nurturing the young churches. That, I believe, was the secret of the outstanding manifestation of God’s power in his ministry. God’s power is not just for our personal benefit and comfort. Rather, and most importantly, it is for confirming the gospel. You and I may have been endued with power like Paul, but we may never know except we start doing something for God as He has instructed in His word and is laying upon our hearts. Father, help me to emulate your servant, Paul, as he emulated our Lord Jesus and help me to fervently serve You all my days in Jesus’ name. One thing remarkable about the apostle, Paul is that he's always at the fore-front. As a persecutor, He was at fore-front. He took as a task upon himself to make sure that Christians are greatly troubled. He traveled far and near, in his bid to persecute Christians. As a preacher of the gospel, Paul was also at the fore-front. This time, he traveled to distant places in his bid to spread the gospel of our Lord. He was so great a preacher that even the other apostles depended so much on him for the gospel to get to the uttermost parts of the world. No wonder the bible captures God's words, "I have ordained him for a mission to the Gentiles". One thing we Christians should emulate from the life of the apostle, Paul, is that we should be the best in whatever we do: be the best of who you are. This is beautiful, Chikwado! Impressive and beautiful! Thank you very much and be richly blessed in Jesus' name. A long post though..BT tnk God I read tru...God plz i need ur grace..nd also help me to emulate d life of ur son Jesus as Paul did.. Amen..tnks Edith for Dis spiritual thought. Thank you too, Onyeka, and a big "Amen" to your prayer. Truely, the apostle paul set a good example for us christians today to follow. thanks for this wonderful spiritual reminder. God bless you more. And bless you more. Paul set the bar quite high but by grace, we can measure up and even exceed his accomplishments. Glory to God! the major thing i learnt from life of Paul while on earth was his life of determination. Even when he was persecuting the Christians,he did it with all his mind. After his conversion,he started working with zeal and Unlimited GRACE of GOD. that is why I love Paul as a person more among all apostles of Christ.Everyone should take note of that. Yeah, it's worth a mention and emulation. Thank you, Victor and remain blessed! St Paul's life is worthy of emulation and it's good we know he was able to conquer because of God's grace. May God grant us His grace in everything we do. God bless you, Ma. Amen. Thank you, Joy, and may God bless you much more in Jesus' name. it is my responsibility to call God, it is God's responsibility to answer me in Christ Jesus, now i know i have to start doing my own part just as apostle Paul did in his time. my time is counting while i have not done anything. thank you for reminding me of this. God bless you, Osita, and make you fruitful for Him in Jesus' name. Although i know the grace of God was upon Paul, I've never really looked at Paul's numerous accomplishments from the angle of grace. The grace of God was upon him, but he also made himself readily available. Food for thought. Yes, as the conclusion says, the same grace may be upon us but we may never know unless we start doing something for God. You are blessed! 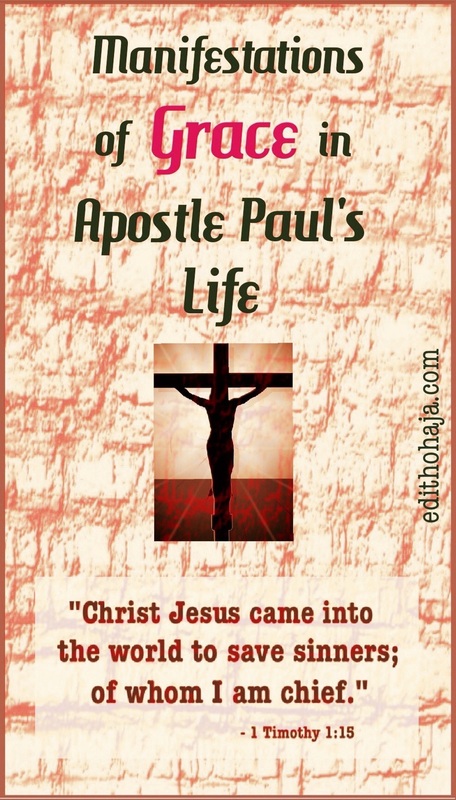 Of a truth, Paul's life is worthy of emulation. His service to the work of God and the growth of the church as recorded is highly commendable and he serves as a mirror to many men and servants of God in the contemporary church.But one thing is sure the grace of God upon his life is hard to comprehend, somewhat bizarre! but it simply explains unmerited favour and how grace operates. You're right, my dear, it's scary sometimes to think that someone can be so sold out to God and his work. But ultimately, that is what every true child of God desires and, by His grace, we shall grow to that level in Jesus' name. wonderful and encouraging, emulation is rather better than envy... let's emulate the wonderful nature of saint Paul... its worthy of emulation. but Aunty Edith, are u a fan of St. Paul? Lol, you ask because I've been writing about him. Yeah, maybe I am in a way. There's so much to learn from the way he conducted himself here on earth. Tanku very much ma. In truism Paul's life is a mirror for all to reflect on. But one thing for all to ask for is grace to stand to the end. You're right. May God grant it unto us in Jesus' name. Tank u ma for this eye opener, in truism Paul is a mirror for everyone to reflect on check if your life gives God glory. But we should always ask for his ( grace) to stand in all things. Thank you very much, Joy! May God answer that prayer for all of us in Jesus' name. Grace really manifested itself in the life of paul. What really caught my attention here is that nobody is unworthy of grace and there is nobody that cant be reached by grace. i am really going to cling to that. Glory to God! That is why it is called amazing grace. You are blessed, Shalom, in Jesus' name. Apostle Paul is one servant Of God whose lifestyle is worth emulating by all and sundry. He discharged his duty with every sense of responsibility. He fought the good fight and he finished the race. God grace was sufficient upon him. With the grace of God in our lives as Christians, we can overcome trials of diverse kinds and above all, fulfill our destiny. it is well written as always. keep up the good work ma'am Edith. Thank you, Chidinma! All glory to God and abundant blessings to you in Jesus' name. Paul is one servant whose lifestyle is worth imbibing. He was unreservedly dedicated to duty. He fought the good fight of faith. He finished the race. God's grace was sufficient upon him. He never insulted the grace mind you. With the grace of God in our lives as Christians, we can overcome every temptation and above all, live out God's purpose upon our lives. May that actually be our experience in Jesus' name. You are going places, Gideon, in Jesus' name. sorry, fellow Christians in this forum, at times i begin to ponder if it is better to live what i tag ":i don't care life" just because the grace of the creator is there for the sinners. i ask because some said the life of Paul is worthy of emulation.though i don't intend finding out faults in Paul's former life, i also believe that once the grace of the creator is upon his child, we believe that old things have passed away but it is not a guarantee to steal, kill and destroy as satanic agent. so Christians should take note. Thanks for that caution against abusing the grace of God. You are highly favoured, Victor, in Jesus' name. Tank u ma for the wonderful post. The life of paul should be a mirror for us christians and we should ask for our own grace to stand till d end. We should indeed! Thank you, Ebere and all glory to God! Spot on! Bless you, my dear! Thanks for dropping by and blessings to you too, Lynn! It is quite clear aunty that u were able to list out at least seven things that the Grace of God was able to do in d life and ministry of Paul. But I really want to say that God's Grace upon a man can enable him or her to do much more better and greater than this. I really Love the post. Is highly inspiring. You're right, Frankline! There's no limit to what the grace of God can do in a person's life. You are richly blessed in Jesus' name. The fact that nobody is beyond salvation keeps baffling me. It makes me thankful and makes me angry... Lol Just imagine people like Boko Haram insurgents, Fulani herdsmen and their resource persons still being liable for salvation after all their massacres?! God is indeed too merciful for me to comprehend! Alas, no one has an excuse to refuse the Salvation of Jesus Christ. My dear, I feel you! This was why Jonah ran away when God sent Him to prophesy against Nineveh. He suspected that the people might heed his warnings and God would forgive them. Imagine that! Jonah felt those people were just too wicked to be spared. But God's thoughts are not our thoughts and His ways are not our ways. He is thoughts and ways are infinitely higher than ours. We never know when we'll be the ones needing a large dose of God's mercy. Ultimately, we have to admit that an over-merciful God is a far better option than the Buddhist idea of karma and reincarnation and their endless and illusive cycles for paying for one's sibs and attaining perfection. Glory to Jehovah! The life of apostle Paul showed me that even a worst sinner can embrace God.Paul lived a life worthy of emulation.he served God with all his strength.I pray d good lord will help us have taste for spiritual life. And that He help us to work for Him as Paul did in Jesus' name. By Hus grace, my dear! He will help you to live right as you desire in Jesus' name. Praise God, and bless you, Ngozi! Right. Jesus has paid the price but it's up to us to accept Him as our Lord and Saviour. I thought I was not worthy but then some things are really clear to me now.thank you Ma for the inspirational write up . Amen. God bless you, Chidi, in Jesus' name. This is indeed a nice article Ma. 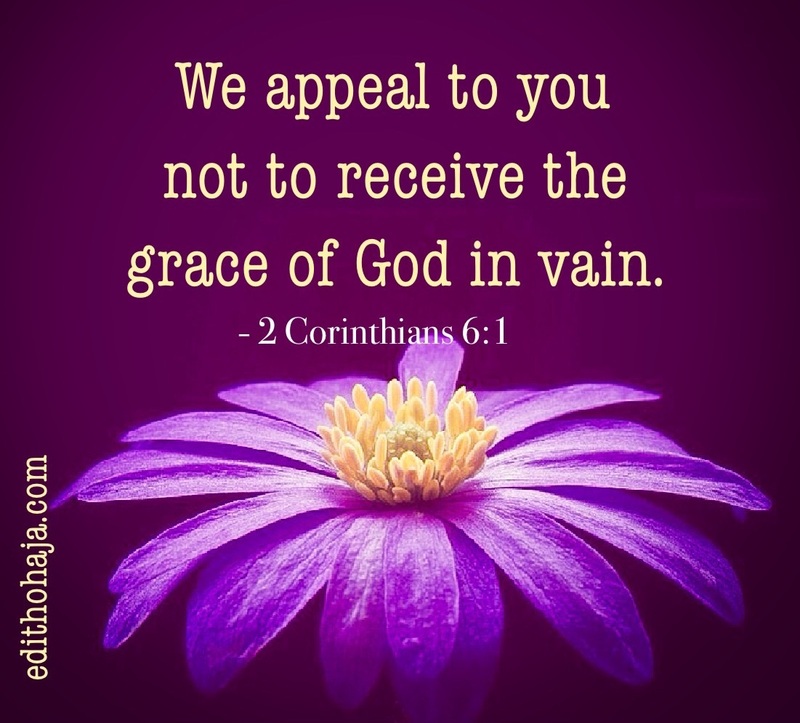 At least imploring the grace of God is all we need to do, also, believing that His grace is sufficient for us in all we do. your posts are always eye-opening and always have a way of speaking directly to the readers. Praise God! You are blessed, Chiamaka! Every Christian truly needs the kind of grace that was existing in the life of Paul. May i never take the grace of God for granted. May we not abuse the grace of God in our lives, rather we should emulate Paul. I strongly believe that God can use us irrespective of our past lives. God is love and His love for us is unconditional. Though we do not deserve it, God freely gives His grace to us. THIS TAKES A LOT OF GRACE AND MERCY TO MARCH ON AND REMAIN STEADFAST. IT ALSO BRINGS TO MIND: THERE'S NONE GOD CANNOT CHANGE. God is willing to forgive us irrespective of our past life, all we need is to return to him like the prodigal son did and ask for mercy. Paul persecuted Christain initially, but turned out to be a strong proclaimer of the gospel of Jesus Christ, he endured suffering on several occasions just to propagate God's word and lived the rest of his life serving the Lord faithfully. All this was made possible by the grace of God. Lord, please fill me with your grace. What I cherish most in the ministry of Apostle Paul is the various gifts which he got by the grace of God which was upon him. I pray for more grace upon my life, just like Paul the Apostle. Nobody is less significant before God, no matter how sinful he or she may be. As a merciful father, no sin is too grievous to surpass His forgiving power as long as it is confessed with a contrite heart and a resolution is made never to go back to such sin. God is not so much interested in how we began the heavenly race but rather, how we brought it to completion. If we have begun the race, let us emulate St Paul who said: “Brothers, I do not consider that I have already attained this. Instead, I do one thing: forgetting those things that are behind, and extending myself toward those things that are ahead, I pursue the destination, the prize of the heavenly calling of God in Christ Jesus” (Philippians 3:13-14). If we are yet to begin the race, let us know that the time is too short. Thank You, Mrs. Edith for this inspirational article through which you catch so many lost souls for Christ. Let's try and emulate Paul's zeal for the work of preaching and healing to restore man to his God, which is the most fundamental. OVERCOMING HARDSHIP #1: CHRISTIAN, FLEE "WHATEVER IT TAKES TO SURVIVE"! !